Oh my gosh... Banana bread is my favorite and the photos of your banana bread is the yummiest I've ever seen! Can't wait to try this recipe! :) Let me know how it goes! I didn't realise it was an Aussie thing - I thought it was just my family who were banana-mad! this bread looks so delicious. So true! I've got some great recipes from my grandma too! My grandpa doesn't make margaritas, but he does make homemade caramel popcorn that's pretty tasty! Sounds delicious. I'll have to try it. The cake? Tasty, yes... but beautiful? Please post that moroccan meatball/egg combo recipe. It sounds amazing and I want it in my belly right now! Mmm yummy! My obsession with banana bread is probably verging on worrying, haha! Mine too, gurl... mine too...! that is awesome. lol I am always asking my mom for recipes. aww it looks so yummy. 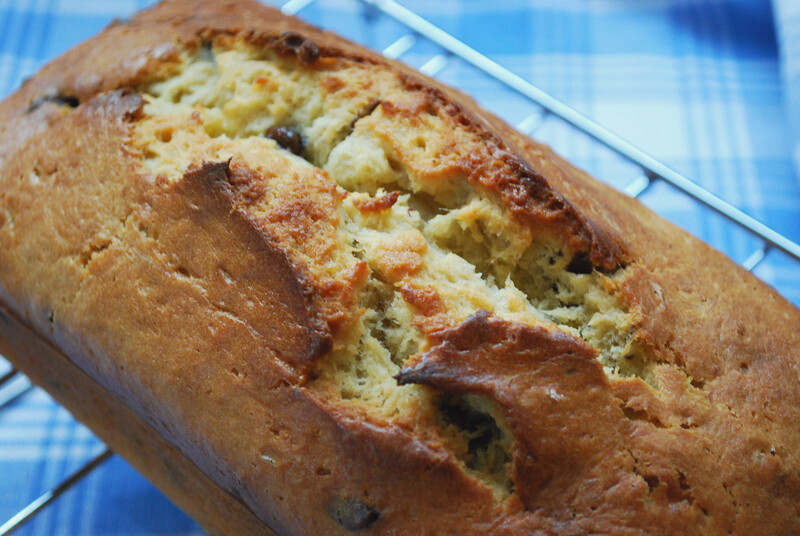 You can never go wrong with banana bread! This is true! 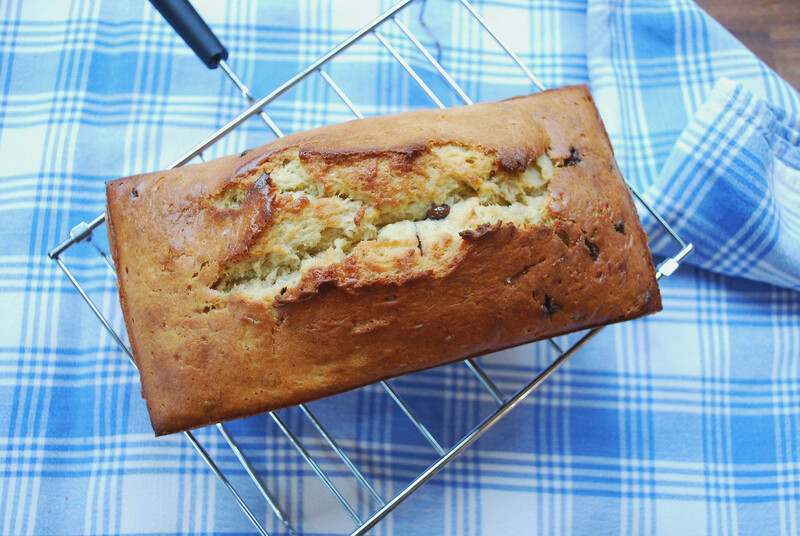 You can NEVER go wrong with banana bread! My Mum AND Father-in-law both make a mean Spaghetti bolognaise. My Stepmum is good at everything and HER favourite is Chicken Basque but I love her Thai salmon in Filo-pastry. When I returned from studying in Indonesia, that's what I requested she cook for me! Haha, you don't have to love it! 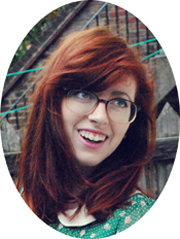 I'll make sure that if we ever have a tea party together, I shan't bring banana loaf! Spaghetti Bolognese is one of my favourite comfort foods, and my mum makes a pretty good one too! Oooh that banana load has got me drooling. I've never put chocolate chips in before - why? I don't bloody know cos it sounds genius! Best recipe my mum ever taught me was a basic sponge - Bit boring but I know it off by heart and can whip it up in no time. It's the basic foundation for all cakes and can be adapted so easily and still be delicious. Whack a load of choc chips in! DO IT! You can even go wild and chop up mars bars and chuck them in too! I love the way you styled the first picture and this looks so yummy. I know right? Where would we be without it? Have a great day Candy! This looks tasty! My bf loves banana bread. 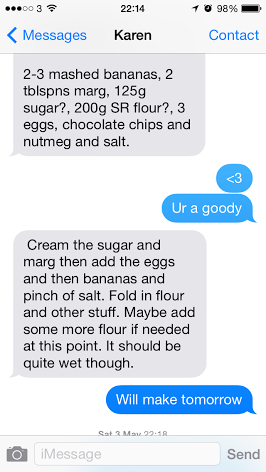 We also message the bf's mum and get recipes like that. It's sometimes so much easier haha. I love the way my mum writes her recipes. They're so vague, but they always work! I swear by my grandma's crumble, and -not to compete!- her banana bread... But full disclosure, last time I made that I forgot the bicarb and made banana black holes instead (v dense). And my parents baked risotto and hoisin-and-honey sausages... Very disappointed not have inherited the family's culinary skill! p.s. your photographs are making me super hungry. Baked risotto sounds amazing. Please tell me it has cheese on top. I need it to have cheese on top. I need to imagine that. Oh my god. I made a banana bread before, but for some reason, I think yours looks/tastes better!!! I should definitely try this out! It looks like it turned out great! Mm banana bread is my favourite but I always buy it. Your recipe looks delectable though! I've never actually seen banana bread in a shop! Cray! This looks like it's really yummy, you've made me so hungry now haha. That recipe looks so delicious! 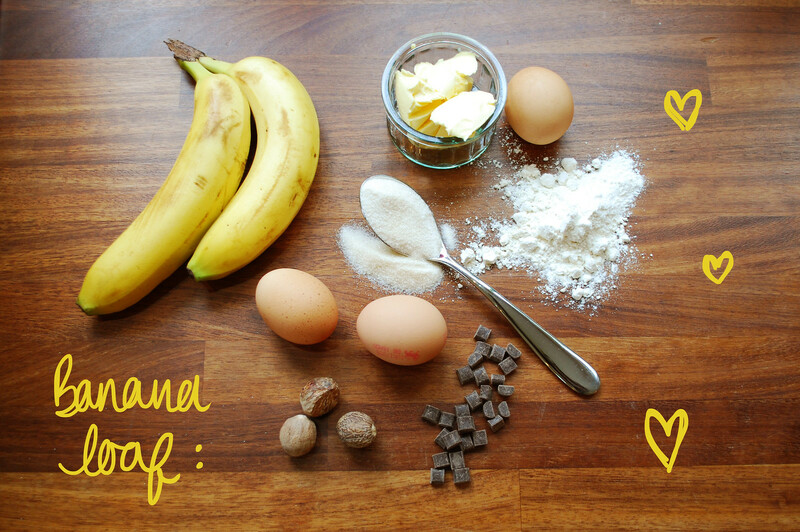 I love bananas, so I must try to make this (or tell my mother to make me one!). Oh yum! This looks so so good! I wish I could make this, but alas my oven is broken! Its wonderful recipe i like very much yummy testy food banana brad so nice recipe thanks for sharing. safety management course in chennai|Industrial safety engineering course in chennai|Iosh ms course training in chennai|nebosh igc training in Tamil nadukeep posting. Movers and Packersin delhi are one of the leading packers and movers. Movers Packers are offering our services not only in Delhi but also other major cities of India.Movers engaged in packing, loading and unloading, transportation/moving, car transportation, warehousing, Packing And Moving services in India. we are the best at our profession.